The Lower Modernisms – 039. 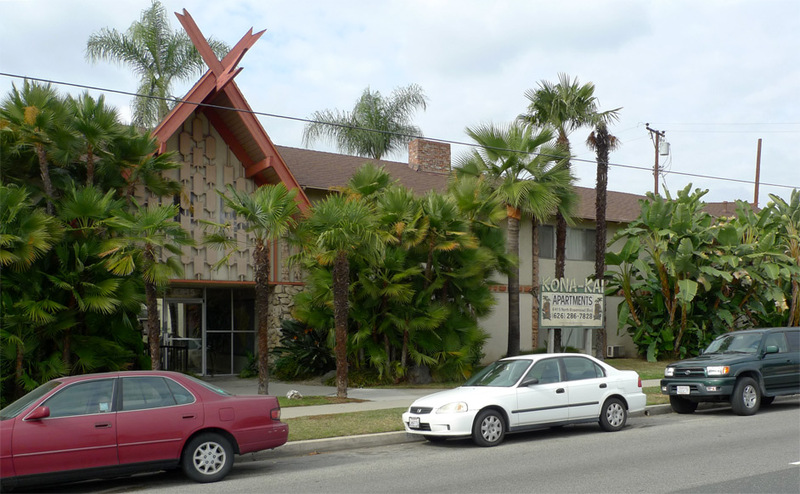 The Polynesian Gabled Apartments of Rosemead Boulevard. Lomo Styles: The Polynesian Gabled. Lomo Building Types: Apartments. January 22, 2012 by James Black. 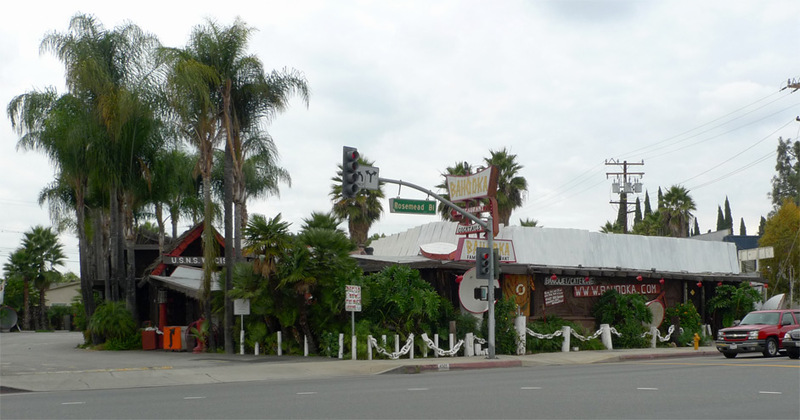 Located at 4501 Rosemead Boulevard in the city of Rosemead is the Bahooka Family Restaurant, a true cultural treasure resembling a tiki bar times ten, filled with fishtanks, and serving ribs and family foods in addition to sugary drinks. 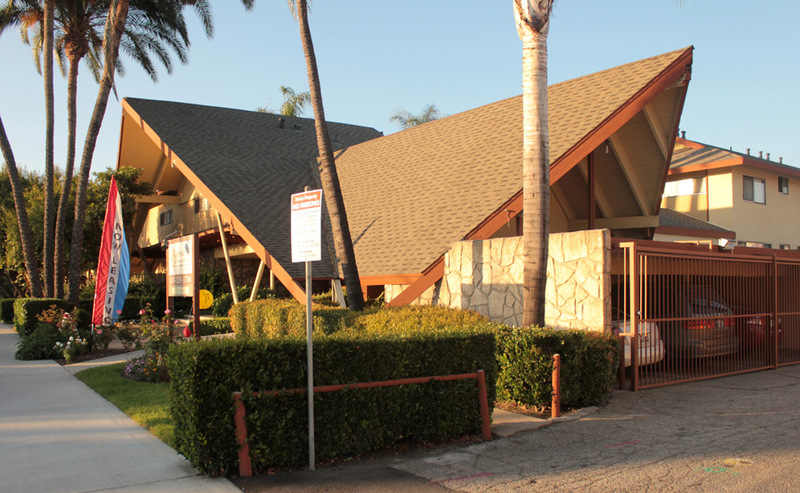 Bahooka is at the approach, presumably by more than mere coincidence, to a cluster of apartment buildings in the Polynesian Gabled style stretched along Rosemead Boulevard. To the north, at 890 South Rosemead in unincorporated East Pasadena, one finds the Huntington at Pasadena. The inappropriately serious name bestowed upon this complex is belied by the exuberant architectural expression. The Huntington’s front is marked by a 100-foot-wide A-frame, so vast that splayed, steel pipe columns were incorporated to help prop it up. Imagine for a moment that you are an architect commissioned to design a two-story wood-framed apartment building. Try to imagine convincing a client, nowadays, to build something as gratuitous as what you see here. 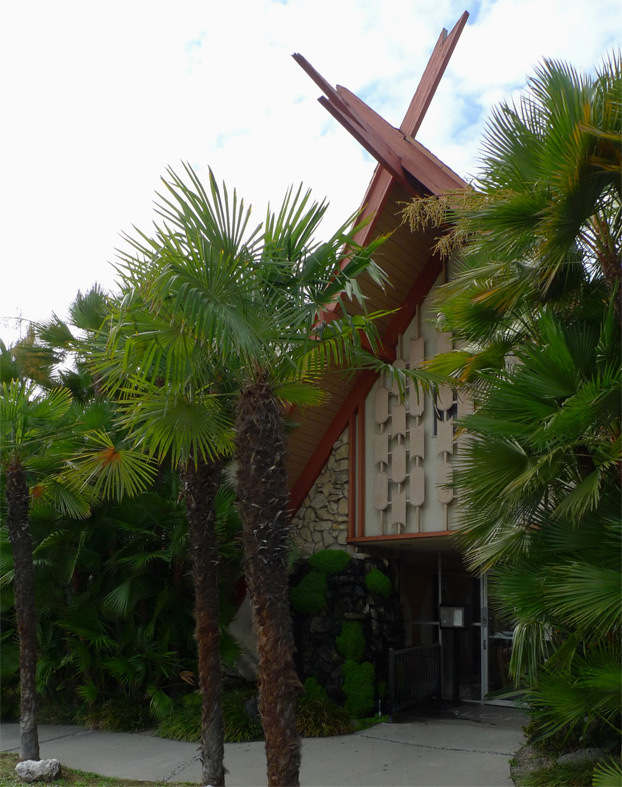 These flying A-frames are raked so that they project farther at their peaks, in a fashion commonly applied to gables and A-frames in mid-century Polynesianized architecture – this device was also used in the Islander Apartments. The steep rooflines at the sides of the Huntington seem even more nautical and redolent of inverted boats in their form. Wood siding and rock-faced walls are both preferred as more Polynesian alternatives compared to the default of stucco plaster. The grooved wood siding on the front wall matches the striated appearance of the exposed planks of the roof. 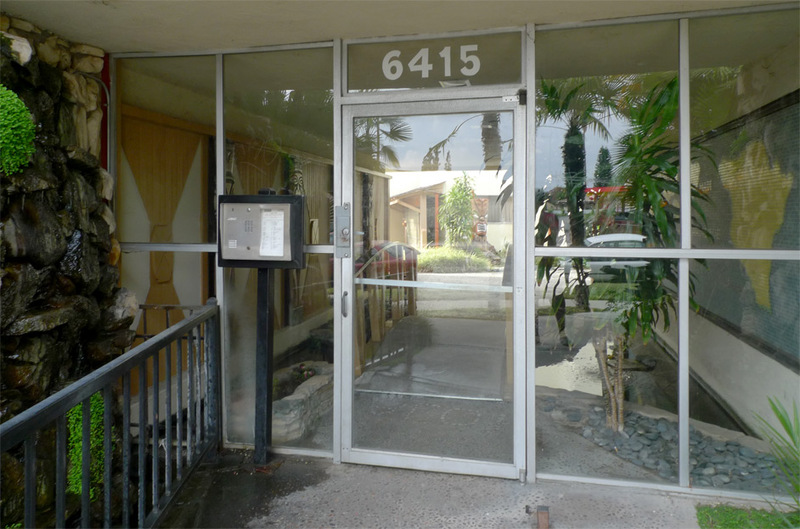 The ground floor level beneath the A-frame is left open to create an entrance to the complex, a Lanai-like zone where the distinction between inside and outside is softened. The jumble of materials, including flying beams, a low roofline canopy created by extending the second floor joists out of the front wall, and the splayed, steel pipe columns, creates interest and a sense of complexity. These elements are not tacked-on decoration, but rather elements derived from an architectonic language of building structure employed for decorative effect. The joists that hold up the cantilevered low roofline are tripled and cut at a rakish taper for effect, but this effect references the structural logic that the depth and thickness of the structure may be reduced out toward the end of the cantilevered span. 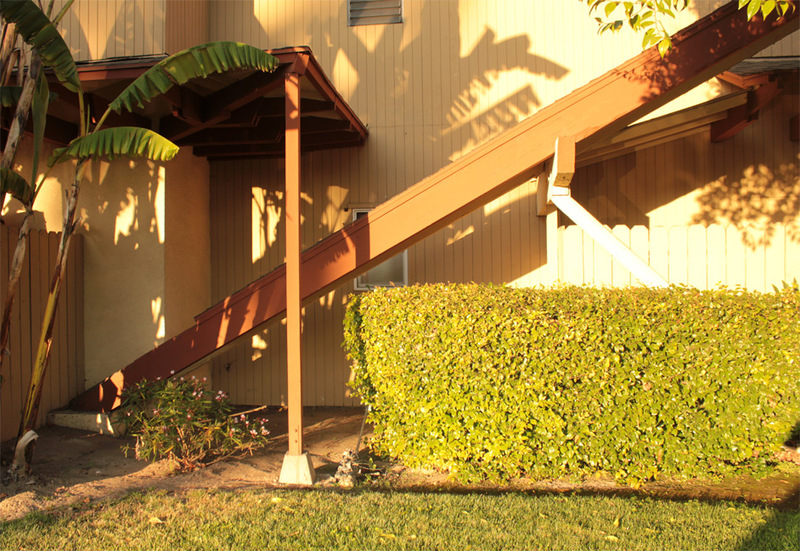 The Kona Kai follows the familiar pattern of marking the entrance with a soaring A-frame. All architectural attention is concentrated in this area. 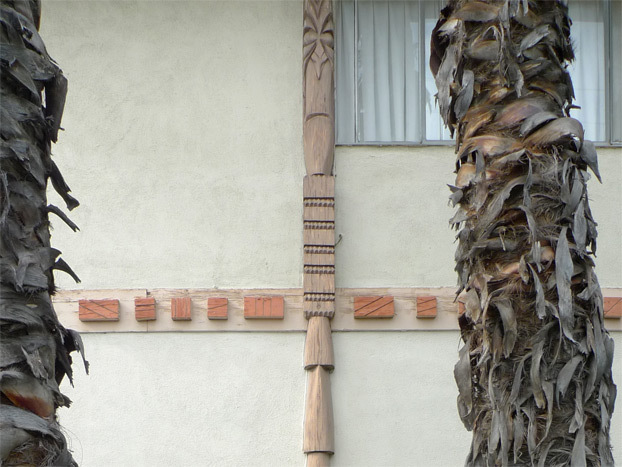 The upper part of the frame is filled in with an unusual wooden screen of nesting hot-dog and pincushion shapes, carved applied tiki gods, and the lower part with rubble rocks. The fascia and ridge beams project decoratively, their ends trimmed with an elongated bird’s-mouth notch, extended and crossed like a trio of hands making elaborate gang signs. Although hard to discern in these photos, an operating fountain to the left of the entrance fills a pool that continues into the complex. I would guess that the storefront wall and door were retrofitted later for security – the entrance really should be open. Beyond the doors the pathway continues across a Japanese-style arched footbridge over the pond, with a mosaic mural of Hawaii on one side and carved tikis on the other. The ten-second journey between suburban Rosemead Boulevard and the banal apartments beyond is an extremely brief vacation in the tropics. At the building’s end, a bird’s-mouthed ridge beam points south. The plaster surfaces are enlivened with applied screeds of carved, unpainted softwood – the verticals are intricately carved tikis, but the horizontals mere blocks, as if the designer nailed random scraps from the yard to the wall. 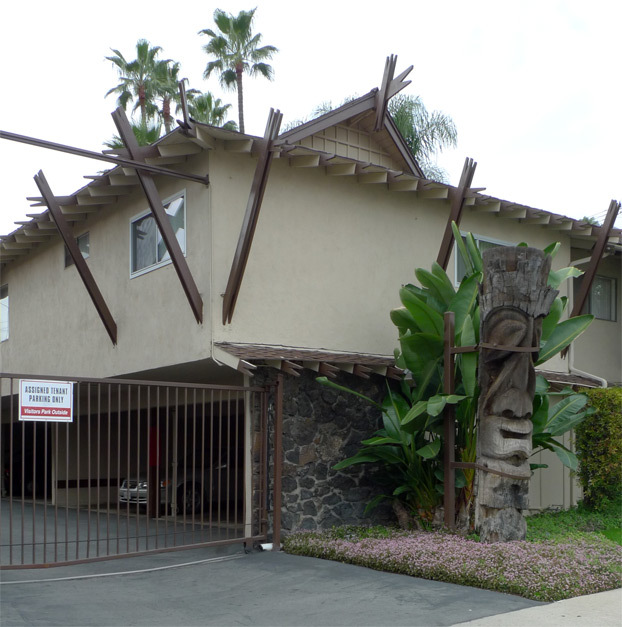 In terms of constructability, they form a grid of horizontal-easy crossed against vertical-difficult – as a builder today, you could readily buy out the blocks, but not the carved tikis. 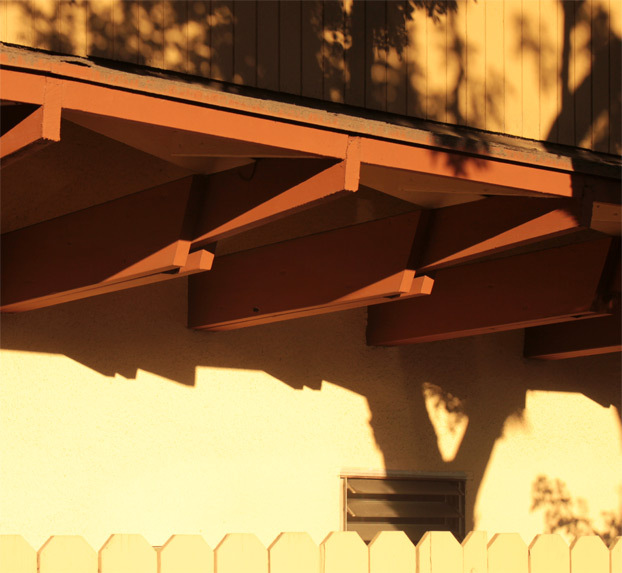 While the Kahlua complex lacks the giant A-frame seen in the previous projects, it is equipped with plenty of gables. Technically, this is a gablet roof (also called a Dutch gable roof), a combination of hipped and gabled roof construction. 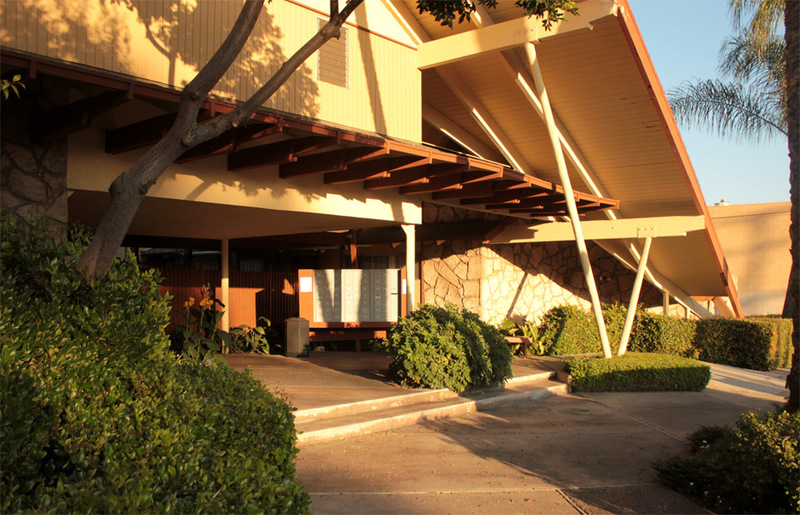 There is some bona fide justification for using this form in a Polynesianized theme building, because such roofs are frequently seen in older Hawaiian buildings. At the Kahlua, whereas the ridge of the roof is flat, the top of the gabled portion slopes up, another method of pursuing that sense of jaunty-casual sought in the aforementioned buildings by the raking of their projected gables. A very large tiki keeps watch over the parking area. At the pedestrian entrance, a large stone fountain fills a waterway distinctly reminiscent of miniature golf courses crossed by a concrete bridge. The Kahlua’s surfeit of projecting rafter tails, ridge beams and buttresses, all tapered and trimmed to a piercing thinness, gives these boxy buildings a prickly appearance. 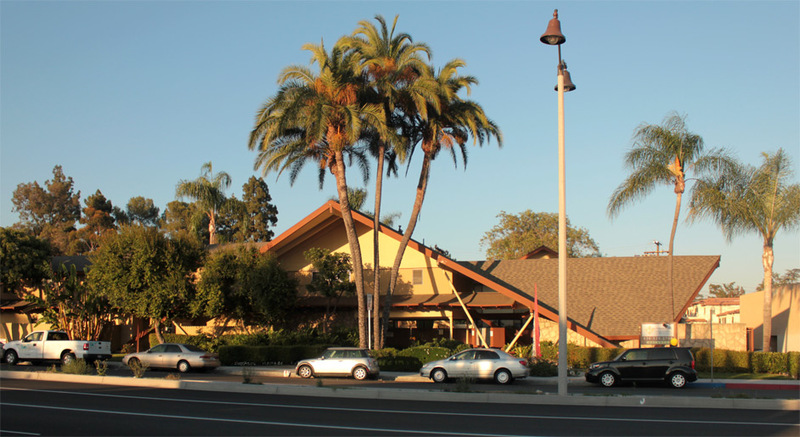 The Polynesian Gabled served as a mannerist alternative to the more restrained and conventionally modernist post-and-beam and A-frame modes. The intricately shaped rafter tails and decoratively extended and trimmed roof beams explore the expressive possibilities latent within the post-and-beam or A-frame systems, without negating them; legitimate and renowned architects designing post-and-beam buildings made use of decoratively extended or twinned roof beams in similar fashion, albeit seldom so gratuitously. The carpentry-intensive Polynesian Gabled roof details recall techniques used in Arts and Crafts houses such as the bungalows of Greene and Greene, and more popularly, in Craftsman bungalows found all over town. The reappearance of these details in the Polynesian Gabled style was both a revival of this carpenter’s design language, and a displacement of it – what might have seemed a homegrown architectural language recast as a symbol of the exotic elsewhere and of tropical adventure. 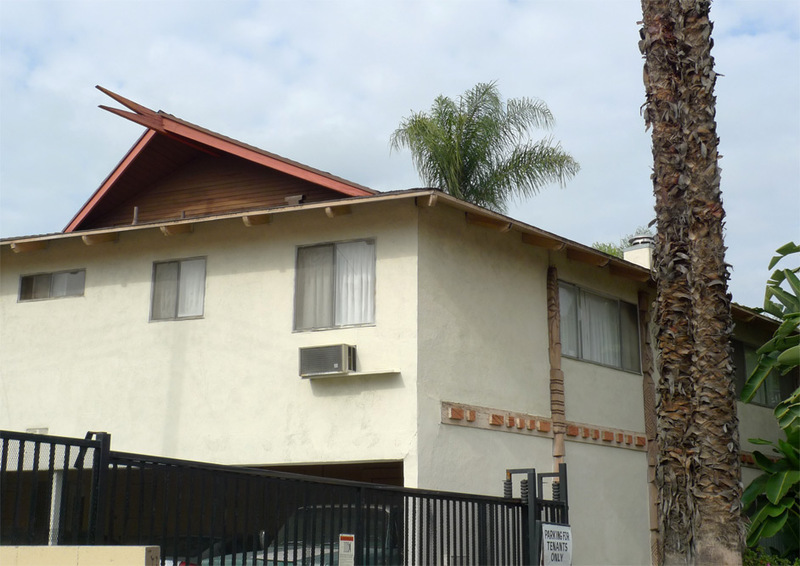 Special thanks to Carmen Cham, Tyler Goss and Dacia Mitchell for bringing these Rosemead buildings to my attention. 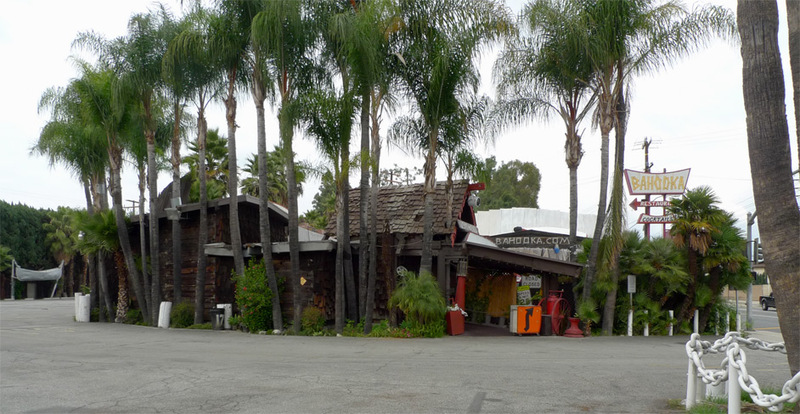 The great thing about these buildings, like the other exuberant forms of the Los Angeles Basin (googie, etc), is the heightened tension between the programmatic needs of the building and the muscularity of the iconographic requirements. This tension, while expressed with an inelegance born of economic and artistic expedience, nevertheless allows the buildings to transcend mere decorated-sheditude and vault into lomo canon. Also, bahooka’s ribs are amazing. Well said. We see a breakdown of the classical distinction between decorated shed and duck. Thank you for recognizing the residential structures in this area – they always turn my head, including Bazooka’s. 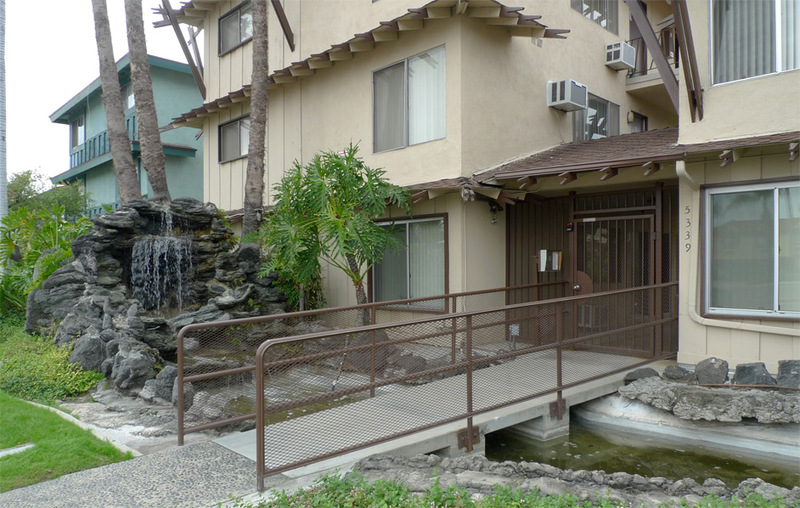 Keep traveling south on Rosemead, into Pico Rivera and a little beyond, you will find some more Polynesian apartment buildings.